Gluttony tends to be a solo pursuit, which is one reason food writers tend to have more knowledge than friends. No memorable high school drives down to the lake, no going on tour with the Dead, no trips to the All-Valley Karate Final  just an uninterrupted series of shameful and solitary feedings. That's the youth of a food writer. But sometimes we get delivered from the prison of our preoccupations, and this recently happened to me. I fell in love and got engaged. So of course, the first thing I thought about was what the food at the wedding would be. Wedding food is universally understood to be bad. The chicken is leaden and the salmon chalky. The vegetables tend to be washed out. You almost never eat well at a wedding. The reason is obvious: it's hard to cook a dinner for 200 people at once. What's more, most caterers aren't really good cooks. Or maybe at home they are. But even in a restaurant, you don't have to serve 200 people all at the same time. Nor do you have to come up with a dish that nobody will object to. Basically, the caterer's job is to not screw up. To put something edible on the table that looks fancy and is warmer than the average body temperature. It's a low bar, but the bride and groom count themselves lucky if nothing goes catastrophically wrong. Naturally, that's not how I approached my wedding. There are restaurants all around New York City that are objects of my special passion  why wouldn't I want their best stuff at my wedding? Most everything can be done ahead of time in hotel pans and reheated at the reception. In fact, most foods are better when reheated. Think of a pan of lasagna. When it's fresh, it's searingly hot, runny, a torrid mess. The lasagna you really want has had time to cohere, to settle, to cool a little. That's the lasagna you want when you come home, famished, at the end of a long drive and find it sitting on the back burners. That's the lasagna you may even pick at directly from the refrigerator, clad only in your pajama bottoms. Why not experience that lasagna at your wedding? It can only get better the longer it sits in its pan. That was my thought, and I put it into action with immense success. I cherry-picked my favorite dishes from half a dozen restaurants. Orhan Yegen's brilliant mezes and hummus from Sip Sak started out, along with a salad made ahead of time by Ed "Eddie Glasses" Schoenfeld of Red Farm, with his memorable Chinese black-vinegar dressing. Jim Lahey of Sullivan Street Bakery, the city's best, was on bread duty, and we had his crusts to smear the hummus on. Michael White of Alto, Marea and Convivio restaurants, i.e., the Sultan of Spaghetti, made the lasagna  and my god, what a lasagna it was! How I wish I had a pan of it now. (There was one left over too, but the staff got it, damn them!) For the vegetarian contingent at the wedding  from the bride's side, naturally  there was a meatless moussaka from the great Greek chef Michael Psilakis of Kefi, with mushrooms and béchamel subbing in for the ground lamb. Doug and Laura Keiles of Ribs Within, one of our top northeast competition barbecue teams, whipped up some smoked tofu, so that even a stray vegan might have some hint of what flavor is. Every taste was accounted for. Of course, not everything can be cooked ahead of time. The marquee proteins, prime dry-aged Creekstone beef and day-boat scallops, were both done on-site. Both were cooked by the Empire Hotel's restaurant chef, Ed Brown of Ed's Chowder House (and formerly of Eighty-One). But the truth is that you didn't need a chef of Ed's caliber to cook these bone-on strip loins. You just put salt and pepper on them, put them in an oven, and have some guy cut them up afterward. (Then you could also make a sandwich on the Jim Lahey bread  recombination is the way to go at these feasts.) Ed cooked the scallops himself in a pan on a little burner, and took inordinate pride in doing so. I felt bad for him; everyone else was living it up, and he was stuck cooking scallops. At the very least, someone should have brought him a steak sandwich. But I was too busy dancing with the bride to Elvis' immortal 1974 recording of Don McLean's "And I Love You So," and too happy at the profusion of great dishes on every side. But, you ask, what about the cake? It will come as no surprise by this point, but we decided against getting a conventional wedding cake that tastes like polyurethane. 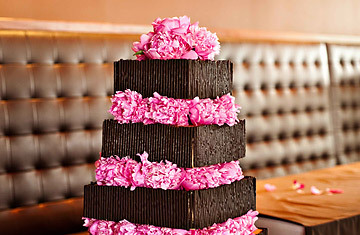 Instead, we had a big multitiered chocolate cake with chocolate frosting and pink flowers all over the place. The cake came over by car with the lasagna: the Sultan of Spaghetti has a brilliant pastry chef, Heather Bertinetti, who made a cake that everyone wanted to eat, even when they were full and drunk and highly emotional  and that's no easy feat. But Heather only had to make cake, in much the same way that White only had to make lasagna, Lahey bread, and so on. Everybody got to do their best work, nobody was forced to carry the whole load, and since all the contributing chefs were invited to the wedding, they got to feel a well-earned pride at seeing their peers ravenously tear apart the dishes they (or in most cases, their underlings) had so carefully constructed. Out of so much destruction, my bride and I created the happiest possible memory, and all the guests got to eat their fill at the greatest wedding banquet ever thrown. So here's my advice to anyone who is starting to plan a wedding: Forget the caterer! Plug directly into the source of your hometown's culinary delights, and happiness, enduring and radiant, will immediately follow. I'm still glowing, and my only regret is not getting to take any of the cake or lasagna home. Josh Ozersky is a James Beard Awardwinning food writer and the author of The Hamburger: A History. His food video site, Ozersky.TV, is updated daily. He is currently at work on a biography of Colonel Sanders. Clarification: Robert Sietsema's open letter to me in the Village Voice today makes me look unethical rather than dumb, and thus requires some clarification on my part. Some of my closest friends are chefs, and when they asked me what I wanted for a wedding present, instead of a crystal decanter that I would never look at, I told them to just cook some lasagna or bake a few loaves of bread that I could share with other friends. I thought, and still think, that wedding food is almost always awful, and that having the responsibility spread out among a few chefs, each doing a specialty in pans ready for reheating, was the way to go. That said, it was dumb of me not to be more explicit about the fact that I did not pay for any of their delicious contributions, and I was wrong not to make this clear to my editor beforehand. I am not an anonymous critic and I don't review restaurants for TIME (or anyone else). I comment and enlarge on trends on gastronomy, which I stay aware of by being close to chefs. I love my chef friends, and wanted to share their food with my other friends. Michael White's daughter was a flower girl in the wedding; Jeffrey Chodorow said one of the seven blessings under the chuppah. It was a mistake, but I was hardly trying to trade column space for goods, as Sietsema is pretending to suppose.